So these are probably my favourite biscuits ever. Other than cornflake biscuits, of course. 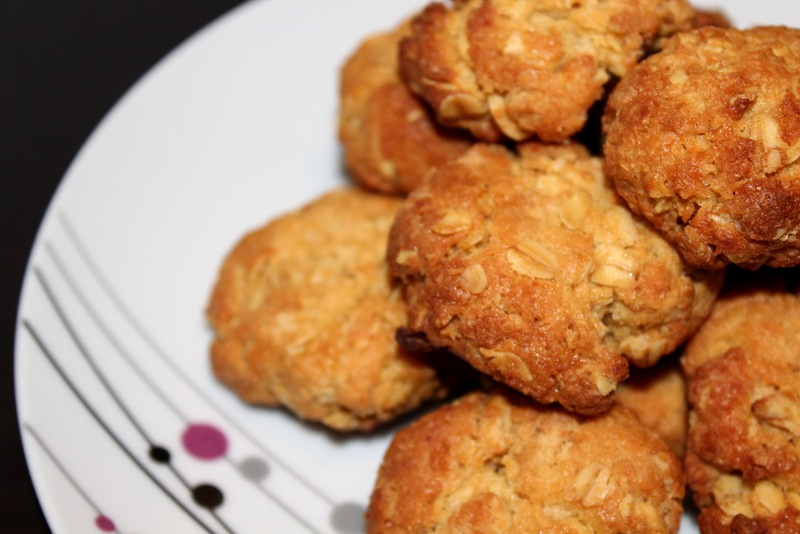 But ANZAC biscuits - something about the chewy coconut, dense golden syrup and slight oaty crunch makes my heart sing and tummy rumble. And that word 'chewy' is a key word here. I don't do crunchy ANZAC biscuits. Hell, I don't really do crunchy biscuits. I'm not really a biscuit person in general, actually. I know, it's weird not to be a biscuit person. It is one sweet I can almost always pass up - except for chewy ANZAC biscuits. Now those of you who like crunchy biscuits, as much as I disagree with you, you can still make these. With ANZAC biscuits, the more golden/maple syrup in them, the chewier they are. 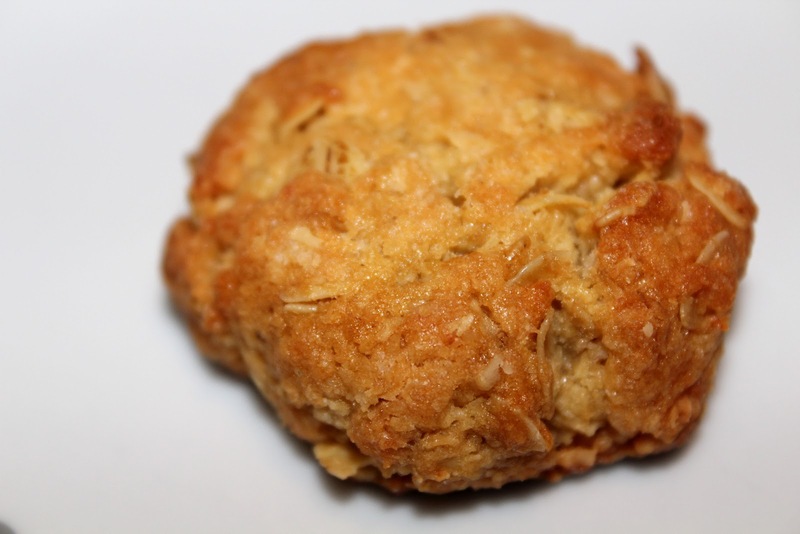 If you prefer a crunchy biscuit, reduce the golden syrup and increase the sugar. Cool trick, huh. I'm afraid I can't tell you what to increase it to, but you can try it. Also, I use the words 'biscuit' and 'cookie' interchangeably here. I say 'biscuit', never 'cookie', but as most the blogs I follow use the word 'cookie', I shall use it here too. But they're really called biscuits. I made these on Tuesday for ANZAC day on Wednesday, and did have a few. They are absolutely amazing. Admittedly, my roomates haven't had any; they were busy eating the multiple brownie batches I was testing this week. I haven't had a great few weeks eating wise. Therefore I am doing the 10 days of real food challenge from the 100 Days of Real Food blog. It's pretty much just cutting all processed foods out of my diet for 10 days, or for me, 2 weeks. No sugar, white flour, white rice, white pasta, etc. I eat clean most of the time anyway, though I do indludge in a few high sugar treats. This has become far too regular for my liking, so I am only allowing myself to eat real food, which includes treats. It also means cutting out some muesli bars, etc, which do include crazy numbers of ingredients. I am sticking to five ingredients per store bought item, with no sugar. So far, day one, I'm doing pretty well. I also made a deal with Mum that if I ate sugar I would have to walk up and down stairs all day and take no elevators, lifts, escalators, etc. I was supposed to start this yesterday, but ate sugar, so I only used the stairs today (try walking up six flights to your apartment with grocery shopping) and ate real good. I am eating some sweet stuff, but it is my sugarless, whole wheat banana bread (recipe soon) and treats from Chocolate Covered Katie such as the delicious Fudge Babies. In fact, they're the only treats I'm allowing myself. I just need to get myself off this sugar kick and back to eating fruit for sweet cravings. 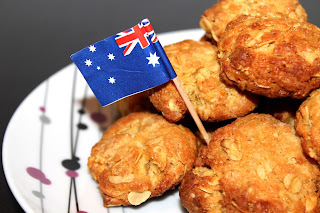 So, these ANZAC biscuits were one of the last sweet things I had. 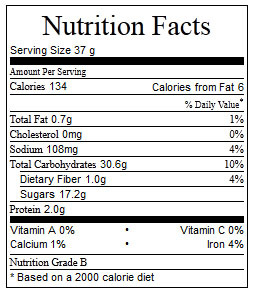 Mind you, looking at the nutrition values, these aren't too bad for you. In fact, they are probably among the best biscuits out there. Occasion: Snack, dessert. Obviously the perfect treat for ANZAC day for all Australians/New Zealanders out there. Menu Options: You can replace the maple syrup with honey, but it won’t taste the same, and I think you would need to up the dosage by at least a tablespoon and add in salt. Otherwise, this is one of those simple recipes that shouldn’t be touched. Makes 12 regular cookies or 24 mini ones. Calorie count based on 12 biscuits. Heat a saucepan over low heat. Place butter and golden syrup in saucepan. Melt the ingredients together, stirring frequently. It is ready to be removed when the butter has melted. While the syrup and butter melts, sift flour into a bowl and add the oats, coconut, and sugar, stirring well with a wooden spoon. Be careful not to reject the syrup mixture though – you don’t want it to burn. Combine the water and bicarbonate soda in a small bowl. Take the syrup mixture off the heat and add the bicarb mixture. It will froth up which is why the saucepan needs to be off the heat. Once the bicarb mixture has been added to the syrup, pour the still hot syrup into the flour mixture. Stir with a wooden spoon until just combined. Using a spoon or cookie scooper, scoop the mixture into balls. Roll the mixture into balls with your hands, and place them on a tray. Ensure the tray is either well oiled or covered in baking paper. This will make 12 regular sized cookies or 24 mini cookies. If you want mini ones, like mine, I scooped up approx a tbsp of cookie mixture. Slightly flatten the balls with the back of your spoon. Make sure they are apart, at least 2cm, on the tray as they will spread slightly when cooking. Bake for 12-15 minutes, or as necessary, until the cookies are a lovely golden brown. Swap trays halfway if necessary. Baking at this temp will ensure the biscuits are chewy, not crunchy, which is how I like my ANZAC biscuits. Allow to stand on the tray for at least 5 minutes. Transfer to a rack to cool, or serve warm. Warm is best. Have a lovely weekend everyone - it's Friday! Nice Recipe! Made them today and they came out great....moist and delicious! I like your writing style and the things you focus on....keep it up!